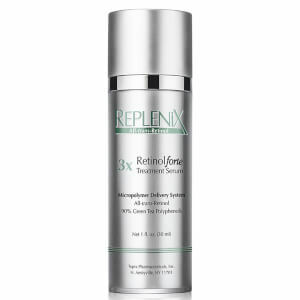 Replenix Retinol Smoothing Serum 3X is an antioxidant-rich formula that protects skin while improving firmness and tone. 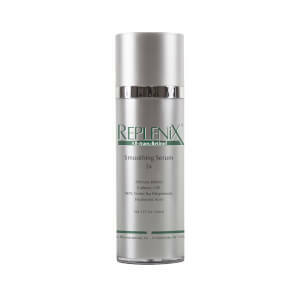 Lightweight and smoothing, the serum is formulated on a base of 0.3% Retinol, and contains Caffeine and 90% Green Tea Polyphenols to protect against external aggressors while diminishing the look of hyperpigmentation to promote a more even skin tone. Enhancing radiance and lifting the appearance of skin, the nourishing serum will leave ageing skin feeling soft and smooth with renewed luminosity. After cleansing the skin, apply to the desired area once daily at bedtime, or as directed by your physician. Cyclopentasiloxane, Dimethicone Crosspolymer, Cyclomethicone, PEG/PPG 18/18 Dimethicone, Caffeine, Camellia Sinensis (Green Tea) Polyphenols, Retinol, Polysorbate-20, Purified Water, Hyaluronic Acid.